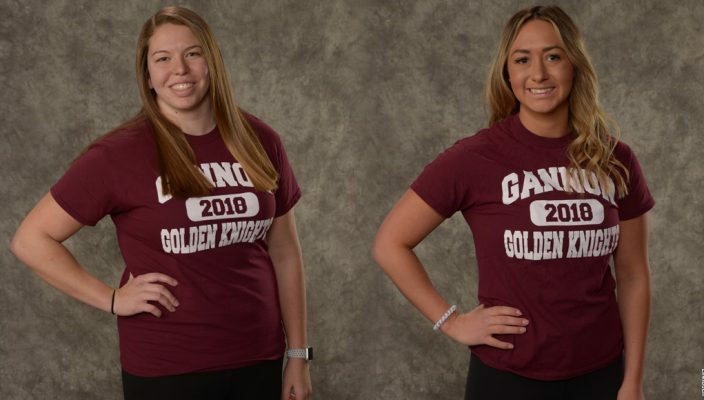 Over the weekend, the Gannon University women’s water polo squad came away with its first victory of the season at the Mercyhurst Invitational. Although the Knights had a tough weekend overall, there were many positives. Gannon’s lone win in its four tournament outings came in a 17-11 triumph over La Salle Sunday. It was the first career win for first-year coach Shane Unger, the fourth coach in program history. The Knights opened the tournament with a tough 15-14 loss to VMI Saturday and then fell 14-9 to Iona in Saturday’s second game. Following the win over La Salle Sunday, Gannon dropped a 17-6 decision to 22nd-ranked Bucknell. That left Gannon with a 1-7 record heading into this weekend’s Washington & Jefferson Invitational. Nicole Wiemken and Campbell Ruh combined for nine goals and proved to be a huge force in the first win of the season for the Knights against La Salle. It was a team effort, though, as the rest of the squad played great defense in order to protect the lead. Four different players scored multiple goals, showing just how balanced the Knight offense can be when firing on all cylinders. In addition to Wiemken, who scored five goals, and Ruh – who added four – Gannon received two goals from Julia Kredinger, two from Maggie Fortin and one goal apiece from Kelly Fehr, Sydney Fountain, Libby Tirak and Lauren Rinderle. Fountain also dished out five assists on the day. Unger said he was pleased with his team’s win, and particularly happy about how the Knights played in the late going. The Knights scored 12 second-half goals and tallied six of the game’s final eight goals. In the first matchup of the weekend Gannon came out strong against Virginia Military Institute, taking a 2-0 lead on goals by Kredinger and Fehr. But the Keydets answered and eventually built a 9-7 halftime lead. The Knights got goals from Wiemken, Tirak and Ruh, but came up one goal short. Gannon trailed 4-1 early to Iona and never recovered. Fehr led the way with five goals while Kredinger added two and Fountain and Rinderle each contributed one. The Knights’ final tournament matchup would be against nationally ranked Cornell. Sitting at No. 22, the Big Red is known for its potent offense. Cornell jumped out to a quick 8-2 lead in the first quarter and did not look back. Fehr once again paced the Knights attack with three goals while Ruh, Tirak and Fortin each contributed one. Gannon will take on host Washington & Jefferson at 10 a.m. Saturday and then battle Villanova at 5:30 p.m. Saturday. On Sunday, the Knights will match up against Salem at 11:45 a.m. and finish the tournament by meeting McKendree at 3:30 p.m.